Manchester United face Liverpool at Anfield in next Saturday”s lunchtime kickoff as the Premier League returns after the international break. We head into the weekend joint-top of the Premier League and already seven points ahead of rivals Liverpool after only seven games. However, the injuries are beginning to mount up for Jose Mourinho in the middle of the park. Paul Pogba has been sidelined for nearly a month with a hamstring injury picked up in our 3-0 Champions League win over FC Basel, and Michael Carrick has a knock which could leave him unavailable for the trip to Merseyside. The 36-year-old has not featured since the EFL Cup win over Burton Albion on 20 September. The international weekend has already resulted in an injury for us as Marouane Fellaini was taken off after only 29 minutes in Belgium’s 4-3 win in Bosnia and Herzegovina yesterday. The Belgian FA have since said that they expect Fellaini will be out for a couple of weeks. This news rules Marouane Fellaini out of our trip to Liverpool next weekend, and likely our trip to Portugal to face Benfica in the Champions League four days later. With Pogba, Carrick and Fellaini all sidelined, Jose Mourinho is left with only Nemanja Matic and Ander Herrera as experienced central midfielders. 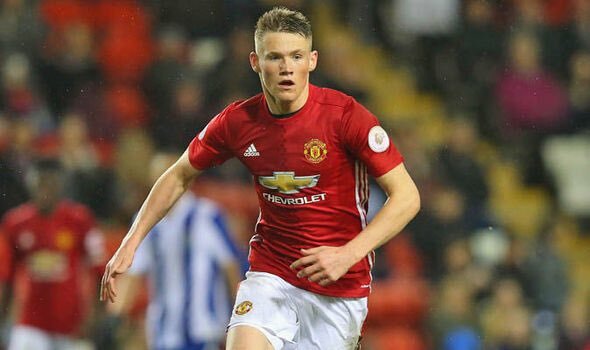 The only other central midfielder in the first team squad currently is 20-year-old Scott McTominay. The 6’4″ youngster played the final 26 minutes in our EFL Cup win over Burton last month – his only first team appearance of the season so far. He was an unused substitute in our 4-1 win at CSKA Moscow in the Champions League the following week. Scott McTominay was named in the matchday squad for our final five Premier League games of last season, making his Premier League debut in the final six minutes of our 2-0 loss at Arsenal. His only other appearance was the full 90 minutes on the final day in our 2-0 win over Crystal Palace. With Fellaini’s injury, McTominay can be expected to be named on the substitutes bench for next weekend’s trip to Liverpool. If we’re up by one goal heading into the final 20 minutes, don’t be surprised if he is introduced as a substitute, just as Mourinho did with Fellaini for our first three games of the season.